If you’re thinking about turning that manuscript into a Kindle file and starting on your own path to indie authorship, you’re likely to find it a pretty easy process–but maybe with one exception. Your Kindle file is going to need an active Table of Contents so users can go to the different chapters in your book with ease simply by clicking on an entry in your Table of Contents. Having a poorly structured Table of Contents may affect your book’s availability, and it can also lessen your reader’s enjoyment of the book. Poor formatting or other marks of unprofessionalism are among the biggest complaints about indie e-books. Setting up your Table of Contents (TOC) shouldn’t be an issue, but if you’ve never done it before and look to the Help page on Amazon for guidance, you’re probably in for a frustrating time. The instructions are vague and assume a lot of prior knowledge. Amazon and other companies offer conversion services, but getting your files ready is something most people should be able to do on their own. Creating the active TOC is really not that difficult, but there are a few steps involved that I’ll lay out for you below. 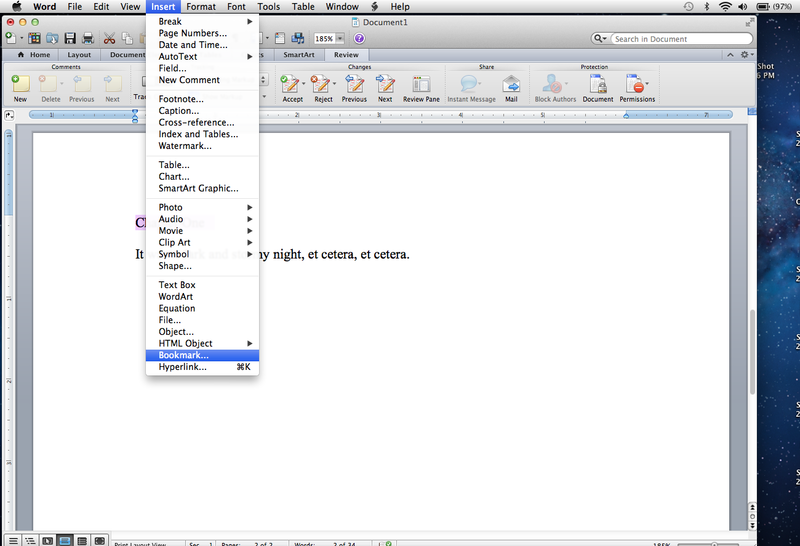 I’m using Word for Mac for these screenshots. Using Word for a PC is basically the same process; it just looks like a little different. If you’re not using Word…well, use Word, okay? 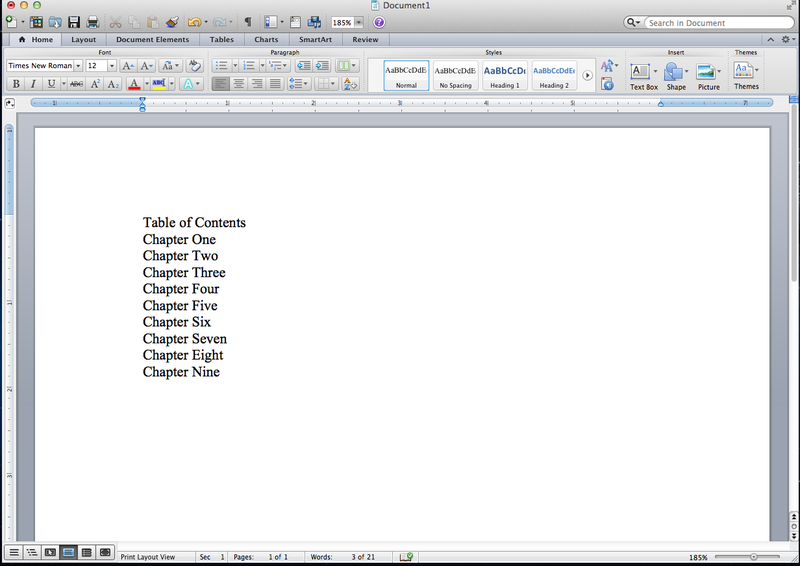 If you have chapter names instead of numbers, type them out the same way. 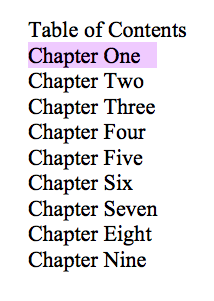 However you’re identifying chapters, just type up a list. Again, hit “Okay” and you’re done. Now the “Chapter One” entry in the TOC appears as a hyperlink. If you click it, you should be sent to the bookmarked location, which should be the beginning of the chapter. Click “Add” and then go to the beginning of Chapter One. 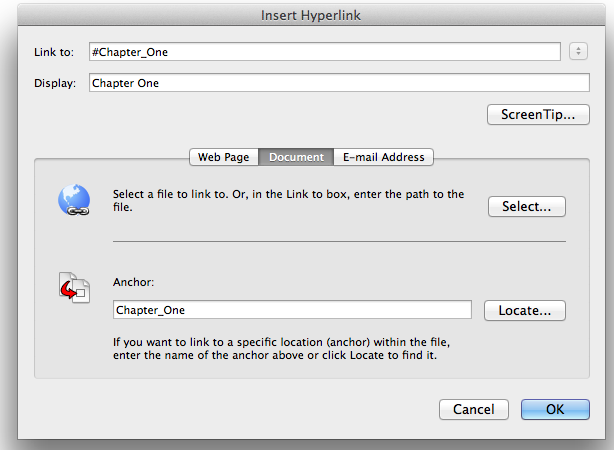 Select the name of that chapter and Insert a hyperlink as you did before. 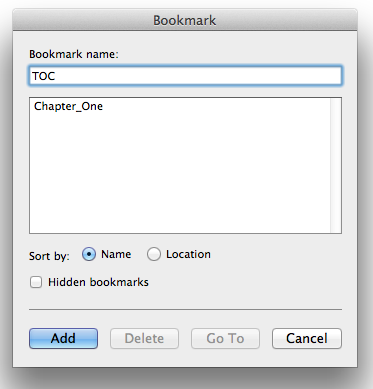 Now, though, you’re going to link to the “TOC” bookmark. 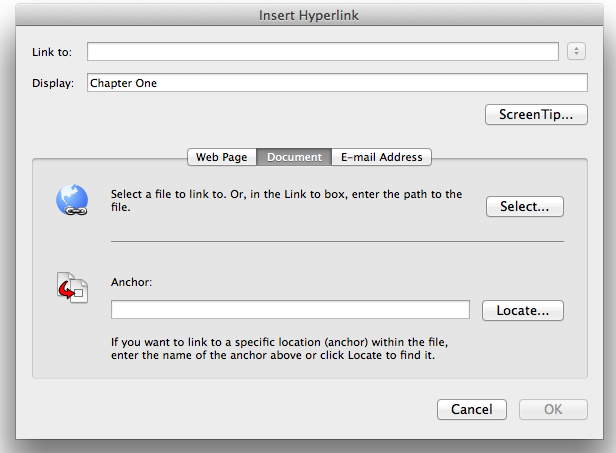 Click “Okay” and then “Okay” again on the Insert Hyperlink page, and your chapter heading is now a hyperlink that takes readers back to the TOC page. Repeat the above processes for all of your chapters and be sure to add hyperlinks and bookmarks for your Acknowledgments and About the Author pages and anything else you want in the TOC. It’s a bit tedious if you have a lot of chapters, but once you get going it won’t take long. 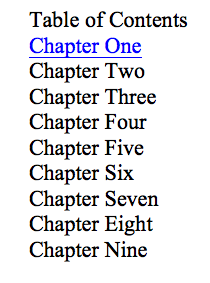 When you’re finished all the entries in your TOC now appear as hyperlinks and you should be able to click on all of them to be taken to the different parts of your book. 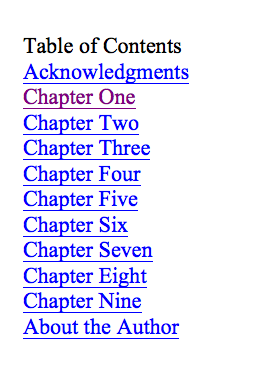 You can then click on chapter names and be taken back to the TOC. This is absolutely brilliant! I had been scouring the Internet for just this information. Exactly what I needed. Thank you so much for making what seemed so difficult from some articles, so easy to follow. Thanks again! Hope to have my book published on Kindle tonight! So glad to hear the article was helpful. Best of luck with your book. Hi. 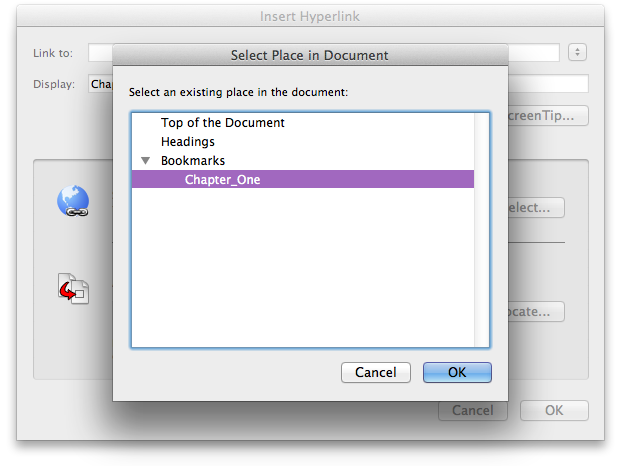 Unfortunately the links worked within word for mac 2011 but did not when looking via kindle viewer, It also said i had not included a table of contents. Hmmm. You might have a look at FAQs. As I recall, the links didn’t work when viewed through the website. If you download the file to your kindle, it may work there regardless, which means all is good. Still, troubling that the you’re getting the error message. All I can suggest is try it again, and make sure you’re not using Word’s TOC generator. You have to do it manually. A sigh of relief emerged from my lips as I found this page. Thank you thank you thank you! GOD BLESS YOU! I was struggling with this, as I was using the Word-generated TOC and getting an inactive chapter listing on my kindle book. Thanks for the much-needed step-by-step. Glad to be of service. Good luck with your book. Thank you. Thank you. Thank you! I’d still be trying to sort this out if I hadn’t found your post! My book, Lessons in Sustainable Happiness, has just gone live! KDP should hire you to rewrite their instructions! You’re most welcome. Glad to be of service. Best of luck with the book. You made this so easy! Thanks so much, Richard. You are a livesaver!! Couldn’t find this information, all of it spot on, as though you knew that writers were baffled. Wish all manuals were written like this! Glad to be of service. Best of look with your project. Thank you! I have been struggling to figure out how to do this. I could find stuff for Word, but not Word for Mac which is different. Just getting started with KDP and your detailed, step-by-step instructions have helped tremendously! I’m glad I was able to help. Good luck with your book. Finally a helpful post!! After days of painting myself into a corner your post was exactly what I needed. Thanks so much! Thanks so much for that clear run through. Amazon is less than helpful, and if you’re using Mac (as I am), often no use at all. Happy to have helped. Best of luck with your book. Great post. Followed it to the letter and created a fine looking TOC that works perfectly on my word doc and also when I converted it to a web page. But once I uploaded the file to amazon, it failed to work and I can’t figure out why. Any suggestions? Thanks. Unfortunately, I have no idea. I know Amazon’s help section is useless on this. Is it failing to work when you check in their Kindle app on the upload page? That might be the problem. I recall seeing something about the TOC not working from that app–might do a google search on the topic to confirm. Have you tried downloading the file once you upload to Amazon and trying it on your Kindle? If it works there, then you’re okay. Otherwise, I don’t have any suggestions. Sorry. Finally, someone who speaks my language. I thank you 100 times. You’re welcome. I’m glad to be of help. Good luck with your project. Don’t want to disappoint you, but that won’t be enough. Sadly. That’s the way I did it. In fact it is descripted in Smashwords Style Guide. This kind of TOC while it provides clickable links it is NOT working with the five point joystick on the Kindle device. (That square button in the middle of the under side of the device.) And Amazon demands that it does just that. Insane, as it is never used when reading novels. When you click the outer middle button on the right side you usually can navigate just with this one button through all of the chapter beginnings. I found that function by default, as I NEVER use it when reading novels. Sorry for the bad English, but I’m German and upset and confused at the moment. Hadn’t heard about this problem before. Glad to see you eventually solved it. Best of luck. Thank you so much for these instructions! It’s perfect now and works perfectly when I preview it on Kindle. I’m glad I was able to help. Best of luck with your book. Thanks very much for the tip. 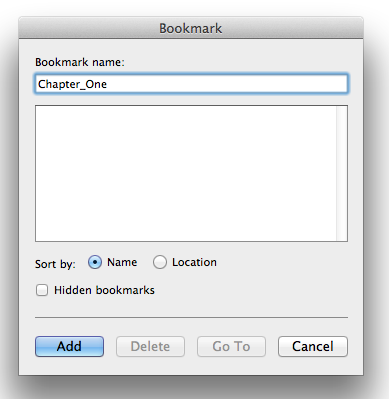 I found that if you bookmark all the chapters in one go and hyperlink later, you can save time and the process becomes less of a bore. One question: for some unknown reason the hyperlinks I get, although perfectly functional, are orange in color, which is not precisely the way I want them to be. Do you have any idea what could be causing this? Anyway, a great solution to a distressing problem. Sorry it took me so long to get back to you. I have no idea what would be causing your problem. I hope you’ve solved it. I did. Just a Kindle preview glitch. Great tip. Thank you. Excellent post. You should do more of this stuff. I’ve been struggling for weeks trying to comprehend how to turn my short stories into book marks. Thanks. I’m glad the post was helpful. Good luck with your book. Glad I was able to help. Good luck with your book. Happy to be of help. Good luck with your book.